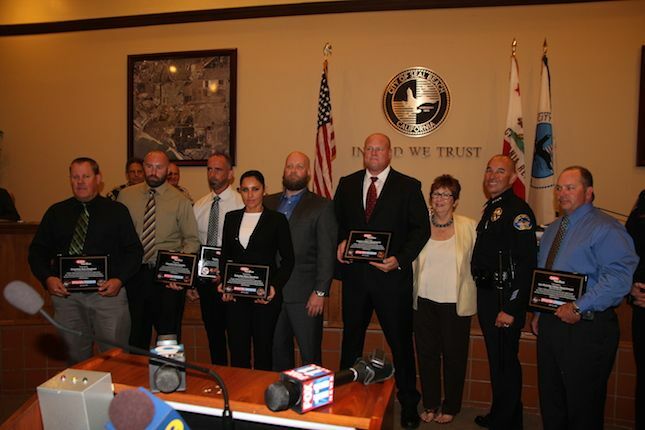 SEAL BEACH, Calif. - Oct. 14, 2014 - PRLog -- Mayor Ellery Deaton and city council honor police agencies for the arrests of ten members of the Long Beach-based Insane Crips gang, as part of Operation Crossover. Seal Beach police and 14 other law enforcement agencies seized more than $50,000 in stolen alcohol. The suspects are alleged to be part of a group that committed almost 100 burglaries across the Southland, spanning Los Angeles, Orange, Riverside, Ventura, and San Bernardino Counties. The suspects allegedly stole safes from about 50 restaurants, including Mahé in Seal Beach. The same gang is suspected in a failed attempt to break into Spaghettini, as well. Law enforcement agencies involved in Operation Crossover include: Seal Beach, Cypress, Los Alamitos, Long Beach, Westminster, Los Angeles, Torrance, Irvine, Laguna Beach, Downey, La Palma and Signal Hill Police Departments, Orange County, San Bernardino County and Riverside County Sheriff’s Departments.